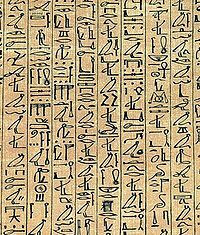 A section of the Papyrus of Ani showing cursive hieroglyphs. If we were to tell the story from the perspective of Egyptian hieroglyphics, the Jewish people did not exist. The Egyptians, like many other peoples, both ancient and modern, not only rewrite history later to make it conform to their point of view, but even pick and choose the elements they wish while the history is happening. There are different ways to tell the story of the Jewish people in Egypt. One is to tell it from the perspective of the hieroglyphics of the time, i.e. from the perspective of ancient Egypt. If we were to tell the story from that angle the Jewish people did not exist. The Egyptians, like many other peoples, both ancient and modern, not only rewrite history later to make it conform to their point of view, but even pick and choose the elements they wish while the history is happening. Nevertheless, what one does find from Egyptian hieroglyphics are certain strange coincidences that the biblical account explains like a missing puzzle piece. The “coincidence” is that 1,312 years plus the previous 210 years would bring us to around the year 1500 BCE, which coincides with what is called in Egyptian history, the “New Empire.” It was a period of radical change in Egypt. Rather than an isolated kingdom, Egypt became an aggressive, world-dominating, expansionist, imperialistic empire. The Egyptian army marched as far north as Iraq, as far south as the middle of Africa, as far west as almost Algeria and as far east as the Persian Gulf. Egypt was the center of the world – indeed it was the world. The New Empire lasted until about 1320 BCE, according to Egyptian hieroglyphics. Then something happened. There is no record in the Egyptian chronicles what happened. All we know is that Egypt suffered a precipitous decline. Its empire crumbled. For about 250 years it was a country of weak kings and small ambitions. Only by year 950 BCE did Egypt begin to make a comeback and slowly rebuild itself into a major empire. However, even then it was not the single world-dominating empire it had been. It was able to rebuild itself enough into a counterforce against northern empires – whether the Phoenicians, Assyrians, Babylonians or Persians – but nothing more. What happened? The Egyptian records tell us nothing. The biblical account fills in the gap. First, the great expansion of the New Empire coincides with the appointment of Joseph as viceroy and the story of how his foresight allowed Egypt to withstand the Great Famine and become the absolute economic center of the civilized world. 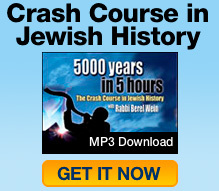 Later, after the Jewish people became enslaved, Egypt was ruined by the miracles and plagues recounted in the Bible. That fills the gap of the missing record, which Egypt’s historians were loathe to share. Will You Carry the Torah?